A significant event in both Cold War history and the history of nuclear policy, the treaty eased global anxiety over fallout from nuclear tests but it also suggested the possibility of a new era in US and Soviet relations. At the same time, the treaty deepened the split between the Soviet Union and China, which was determined to test nuclear weapons despite the treaty. While France and China would ignore the LTBT and test weapons in the atmosphere for years to come, the treaty was a significant international public health success by eliminating the atmospheric testing of the nuclear superpowers. Nevertheless, the limited test ban signified a deeper failure to negotiate the comprehensive test ban that proponents saw as important for curbing nuclear proliferation and checking the U.S.-Soviet arms competition. Indeed, the LTBT facilitated superpower nuclear arms development by making underground nuclear tests a routine event. Forty years later, diplomats have negotiated a comprehensive test ban treaty (CTBT) that bars all nuclear weapons tests, but the United States and other major powers have yet to ratify it. Growing concern over fallout fostered politically influential antinuclear activism around the world. Adlai Stevenson, the Democratic Party's presidential candidate in 1952 and 1956, took strong positions in favor of a test ban. (Note 7) Dwight D. Eisenhower was personally interested in halting nuclear tests but his administration was divided. Top advisors, such as Atomic Energy Commission Chairman Lewis Strauss fervently supported testing and downplayed the fallout problem. Strauss along with senior Pentagon officials agreed that testing was necessary to maintain the U.S.'s superiority over the Soviets in nuclear weapons technology. (Note 8) Secretary of State John Foster Dulles, along with Eisenhower himself, realized that a moratorium on nuclear testing leading to a comprehensive ban test ban would improve the US's image. During a May 1954 National Security Council meeting, the president stated "We could put [the Russians] on the spot if we accepted a moratorium. . . Everybody seems to think that we're skunks, saber-rattlers and warmongers. We ought not miss any chance to make clear our peaceful objectives." (Note 9) Nevertheless, Eisenhower was reluctant to oppose the AEC and the issue was stalemated. The Geneva test ban negotiations, which lasted from late 1958 through early 1962, were difficult and protracted largely because of continued controversy over the requirements of verification. The United States consistently pushed for on-site verification to ascertain whether a questionable event was an earthquake or a nuclear test. Some of the pressure was based on a firm belief that remote instrumentation was not, in itself, sufficient to conclude whether a suspicious event was a test or not. Significantly influencing U.S. policy thinking about inspection was the conviction that it was a way to open up Soviet society to "qualified observers", as Eisenhower put it in early 1959. Various efforts to break the stalemate failed and disagreements increased in late 1959 when the U.S. and the British tried to prompt a discussion of the problem of seismic detection in the light of the new data. Nevertheless, differences narrowed during the spring of 1960. The negotiators reached an agreement on a threshold test ban that would forbid atmospheric, outer-space, and underwater tests, except for small underground tests, on which a moratorium would be placed. At that point, the three powers would have to resolve two issues at the highest level: the number of inspections in each country and how long the moratorium would last. (Note 14) The possibility that an agreement would be reached at the Paris Summit in May 1960 disappeared, however, in the wake of the shoot-down of a U.S. U-2 reconnaissance plane flying over Soviet territory on 1 May 1960. While the talks at Geneva continued, disagreements over verification were not likely to be overcome in the harsh post-U-2 crisis environment. Kennedy's staff reasoned that such a deal was possible with the Russians because they, like the US, had to be aware that China's weapons could just as easily strike Russia as they could the United States. CIA official Sherman Kent pointed out that the USSR would be loathe to see atomic weapons in China because in the event that China took aggressive action against a U.S. ally in East Asia, the Soviets would have to make a decision: "Whether to stand by and see China . . . knocked into a cocked hat [by the United States], or whether to come to China's defense. . ." (Note 19) The latter course of action could force the Soviet Union into an unwanted nuclear war with the United States. In the following years, 108 countries signed the Limited Test Ban Treaty, the major exceptions being France and China. Although the Americans, British, and Soviets stopped atmospheric testing, China and France saw the treaty as an example of superpower hypocrisy and never signed it. (Note 32) The Chinese exploded their first nuclear device on 16 October 1964 and held 22 more atmospheric tests through 1980. 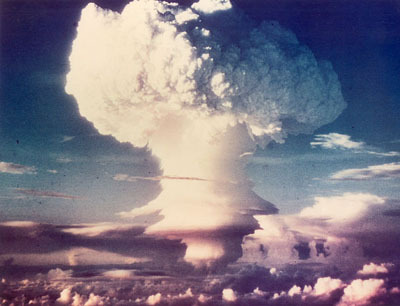 France held 50 atmospheric tests in the South Pacific from the mid-1960s through the mid-1970s. Note: The following documents are in PDF format. You will need to download and install the free Adobe Acrobat Reader to view. This document is an analysis of the effects of radiological fallout produced by the notorious Castle Bravo test held in the South Pacific of 28 February 1954, whose yield, 15 megatons, far exceeded the 8 megatons that the weapons testers anticipated. Producing what has been called the "worst radiological disaster in American history," the fallout from BRAVO spread hundreds of miles touching the crew of the Lucky Dragon and generating a storm of controversy around the world. (Note 34) This technical analysis, prepared by the Armed Forces Special Weapons Project--the predecessor of today's Defense Threat Reduction Agency (DTRA)--discussed the size and patterns of fallout and how variables such as wind can affect the movement and scope of fallout. The conclusions showed the deadly power of the Bravo shot: the detonation of a 15 megaton weapon contaminated "very large areas" on the order of 5,000 square miles "in such intensities as to be hazardous to human life." The "radioactive fall-out hazard [was] a primary anti-personnel effect" of such high-yield weapons. In light of Moscow's campaign for a halt in nuclear tests, analysts at the State Department looked closely at Soviet motives. During mid-1950s discussions, Soviet diplomats had made the argument that a ban on nuclear testing would raise barriers to "countries which do not yet possess [nuclear weapons]" because they could not be developed without testing. Writing on behalf of himself, intelligence analyst Helmut Sonnenfeldt, and European affairs specialist Robert McBride, Farley suggested that the "Soviets probably do believe that a test ban would be a relatively cheap way of stopping or at least inhibiting fourth country nuclear weapons capability." This could raise obstacles to U.S. nuclear weapons cooperation with NATO Europe but it could also help the Soviets "resist any pressure" from China and other "satellites" for the delivery of nuclear weapons. be used only for peaceful purposes." While Atomic Energy Commission Chairman Lewis Strauss strongly objected to a halt in nuclear testing, Dulles argued that failure to take arms control measures could cause the loss of major allies such as Japan, Germany, and the United Kingdom. "Do we want further refinement of nuclear weapons at the cost of the moral isolation of the United States?" This discussion, held just as the Geneva Conference of Experts was winding up, further illuminates the internal U.S. government controversy over participation in a nuclear test ban agreement. The Geneva conference had developed a proposal for an international monitoring system that would permit relatively high confidence (80 to 90 percent) in detecting atmospheric and underground tests, but senior scientists in the nuclear weapons establishment engaged in controversy over whether it was possible to conceal underground tests. Thus, Edward Teller, the director of Livermore Radiation Laboratory, a major opponent of a test ban, argued that it would be possible to "dampen" the seismic signals produced by underground tests while Carson Mark, of Los Alamos Laboratory, took a contrary view. During this meeting, strong Defense and AEC views in favor of continued testing surfaced. The new Atomic Energy Commissioner, shipping magnate John McCone argued that the United States should not stop testing because negotiations were "likely to go on indefinitely." Presidential science adviser James Killian suggested, however, that it was worth taking a chance because "the talks at Geneva had accomplished something never achieved before in the way of serious discussions of disarmament controls." Despite Eisenhower's approval of the moratorium, such influentials as Edward Teller did not hide their doubts. Pointing out to "loopholes" in the Geneva system, such as the problem of detecting small nuclear explosions or "interplanetary" tests, he observed that Livermore Radiation Laboratory was especially interested in the problem of developing small nuclear weapons, with several small-yield "tactical" and "defensive" devices to be tested before the moratorium began. Noting the lack of knowledge about "what the Soviets had "done in this yield range," Teller constructed an argument about the possibility of concealing underground tests by reducing the "coupling of the energy of nuclear explosion by one-third or even one/tenth." Given this problem, Teller sought an opening for underground nuclear tests in a partial test ban system, such as permitting tests "that could not be detected by the system" or with yields below a specified magnitude. On 18 November 1959, PSAC member Hans held a "private, delicate" discussion on the negotiations with acting secretary of state Christian Herter. While the talks were going "slowly" Bethe saw the Soviet commitment to the verification plans developed by the conference of experts as a "hopeful" point. One sticking point was the U.S. insistence that a test ban treaty be linked to progress on disarmament generally; Bethe was not the only one who believed that this position was unworkable and within a few months Washington would officially abandon it. When Herter asked about the impact of a long-term test moratorium on the U.S. nuclear position, Bethe argued that the U.S. nuclear establishment was "in a far better position to continue nuclear weapons development" because it was ahead of the Soviets in understanding of the inner workings of nuclear weapons ("diagnostics"). Perhaps thinking about Teller's arguments in favor of testing, Herter asked whether the U.S. needed to "improve [its] small weapons position." Bethe replied that improvements were possible but that it was not a critically important issue: Washington had weapons of "every type in every yield." He was more concerned about the British position on verification because he believed that they would "be willing to settle for substantially less than we will" on the grounds that any controls that the Soviets accepted would be "gravy." Well before the Hardtack errors were discovered, on 5 January PSAC publicly announced the gist of new data on underground explosions: that "there will be a substantial increase in the number of earthquakes that cannot be distinguished from underground nuclear tests by seismic means alone." This information, which cast doubts upon the findings of the Geneva conference of experts, was duly communicated to the British and Soviet delegations at the Geneva test ban treaties. The Soviets had already expressed disagreements with U.S. proposals on the control system, e.g., they had supported the right to veto recommendations for inspections by control authorities, and made plain their unhappiness with Washington's bombshell. Treating the statement on new data as a "diversion", the Soviets declared that it was "inadmissible that this political [conference] could take up technical subjects which would only protract its work." The "only technical basis on which [they] could proceed" was the report of the Geneva experts. During this White House meeting, Eisenhower agreed on the importance of breaking the disarmament-test ban linkage, supporting the view that the issue of the "control system" was the "heart of the matter and that the "breaking point" with the Soviets had to be the control system. During the course of the discussion, Eisenhower and his colleagues reviewed U.S. motivations for supporting the moratorium ("propaganda mileage"), doubts that the Soviets would ever approve a "true agreement," the importance to the "Free World" of inserting "qualified observers within the USSR," and the difficulties that the United States would have "in carrying out a treaty of this type." If an agreement allowing for many observation posts was not negotiated, Eisenhower believed that the difficulties in test detection could make it necessary for the United States to conduct small underground tests. The more difficult, immediate problem, as Dulles observed, was "our reversal of position as to the size of the explosion which may be detected underground." This "will appear to the Soviets as a breach of faith." The United States was in a "bad spot." AEC chairman McCone was less concerned about a "breach of faith" than he was with the impact of the new data on the U.S. nuclear position. During a meeting with Dulles, he pushed for change in the U.S. negotiating position: ban atmospheric nuclear tests but permit underground testing until the verification issues had been resolved. Dulles heard McCone out, but argued that the AEC proposal was politically impossible. Even if there was only a small, one in a hundred, chance that Moscow would accept U.S. terms for a treaty, "public relations" necessities required Washington to stick to the plan for a comprehensive test ban. If the McCone proposal was put on the table, it would "allow the Russians to break off the negotiations with the United States with the United States bearing the entire blame for their failure." As it was, Dulles believe that press coverage had already inflamed tensions with the Soviets with the latter arguing that the articles confirmed that "we were looking for a way to break the negotiations off." Recognizing that he could not win an argument with Dulles, McCone backed away from his proposal although suggesting that Dulles' own State Department may have been the source of the leaks that had inspired the press coverage. not inject these new technical considerations at this time." Macmillan also pointed to the role of non-proliferation concerns in the movement for the test ban treaty. Suggesting that permitting any testing could give a loophole to would-be nuclear powers, Macmillan said that the problem of "Nth power development" made it unwise to permit continued underground testing. A meeting of the Committee of Principals, the most senior inter-agency group on arms control issues, held a few days later led to agreement that if the Soviets stuck to ideas about a veto on inspections, the U.S. and the British should offer a ban on atmospheric nuclear tests with "collaboration on a program of underground tests to test improvements in the detection system." If, however, the Soviets dropped the veto, acting Secretary of State Herter observed that Washington would have to live with an "imperfect" detection system. "The President feels that we need to be sure only that there is a reasonable level of deterrence." This worried McCone who thought it was a "new concept" but test ban negotiator James Wadsworth and State Department official Philip Farley argued that the notion of deterrence had been part of the government's thinking on the test ban since negotiations began; "the inability to achieve 100 percent perfection was recognized." With the impasse over the veto, on 13 April, Eisenhower, with Macmillan's support, presented a new proposal that was close to McCone's suggestions: a ban on tests in the atmosphere up to 50 kilometers, with additional negotiations eventually expanding the scope of the agreement. (Note 38) The Soviets rejected this proposal in the name of a comprehensive test ban, but as this document shows Khrushchev was giving ground on the veto question. He suggested that sending inspectors to investigate suspicious physical phenomenon would be the principal means for verifying the treaty. According to Khrushchev, an agreement on a specific number of inspection team visits would "preclude the necessity of voting on obtaining agreement on that question within the control commission." He did not propose any specific number but suggested that "no large number would be necessary." The fact that they could occur, he argued, would have a "sobering effect" on the signatories, tacitly deterring any cheating. Whether London, Moscow, and Washington could agree on what "no large number" meant would be a decisive issue in reaching a negotiated test ban. While negotiations continued, the Committee of Principals met to hear a report on detection and on-site inspection of underground tests by Caltech scientist Robert F. Bacher. Noting that the seismology was "still in its infancy", he suggested that theories about evading test detection through decoupling "held forth possibilities which could change the underground detection situation completely." He was skeptical, however, of the "complicated" decoupling theory that had RAND scientist Albert Latter had advanced because it would "require an approximately 1 million-cubic meters hole for a 10 kiloton explosion" at a cost of 2 to 4 million dollars. Nevertheless, Bacher declared that, despite the "Latter hole's" apparent impracticality, it "has stood up against severe theoretical scrutiny." (Note 40) Bacher also made a series of recommendations on the problem of on-site inspections, especially whether inspection should be based on a percentage or a quota. While some of his recommendations are excised, they pointed to the uncertainties of detecting underground tests and the need for continued study on ways to reduce the doubts. Further study would eventually lead to the Vela project findings that U.S. experts had overestimated the problem of small earthquakes in Soviet territory. Not long after the Committee of Principals heard the Bacher panel report, President Eisenhower heard a briefing from science adviser George Kistiakowsky summarizing Bacher's findings. Using the erroneous data about the frequency of small earthquakes on Soviet territory, George Kistiaskowsky, who had replaced Killian as White House Science Adviser, underlined the uncertainties of underground test detection. Unless the United States inspected all seismic events in the Soviet Union that were the equivalent of a half-kiloton explosion, about 1715 annually, he argued that the "probability of identifying at least one out of a series of below 5 kilotons is negligible." The possibility of decoupling the seismic signal from an underground nuclear test through the "Latter Hole" increased the uncertainty. Hypothetically, a nuclear power could test a 100 kiloton weapon decoupling it by a "factor of 200." The resulting half kiloton signal would be virtually undetectable. Briefed on these uncertainties, Eisenhower concluded that it "appeared impossible to control underground tests". (Note 41) During the months that followed, Eisenhower began to favor a limited agreement involving a joint U.S.-British-Soviet study program of underground test detection. It would take some time, however, before the administration was ready to take a step that represented a significant detour from the goal of a comprehensive ban. Sharp inter-agency disagreements over whether to publicly abandon the goal of a comprehensive test ban and resume nuclear testing persisted but the State Department's stance against any sudden policy changes prevailed. Instead, the Department supported proposals for technical discussions with the Soviets as a way to "sharpen the issue of underground control to the point where we could propose a limited agreement" that would include provisions for a research program on underground test verification. (Note 42) During an early November 1959 meeting with "establishment" disarmament advisers, Philip Farley reviewed the state of play. At Geneva, the U.S. had presented the Soviets with technical conclusions on underground testing that could bring Washington "face to face with the question of whether we are going ahead with a proposal for a limited treaty and either resume tests or declare our freedom of action with respect to further testing." The Soviets were unlikely to accept a limited treaty while the British were seeking a three year moratorium on underground testing. That concerned the State Department because, as Herter put it, the West would "get nothing in return." Nevertheless, he recognized the need for some give in the West's position because world opinion was suspicious of the U.S. stance. As former Supreme Allied Commander Europe (SACEUR) General Gruenther explained many believed that the U.S. was pushing the difficulty of underground test verification as a "device to get out of the negotiations." Killian explained the theoretical challenge posed by the "Latter Hole" although McCloy was doubtful because "the difficulties of constructing the big hole were almost insurmountable." The advisers also discussed the UN disarmament committee, the Charles Coolidge study on disarmament, and the problem of "stability in the missile age," which concluded with Gruenther's sardonic statement that to "to proceed with disarmament we will have to increase our defense expenditures." Harold Brown, soon to be director of Livermore Radiation Laboratory and a future Secretary of Defense, served as scientific adviser to the U.S. test ban negotiating team at Geneva during 1958-1959. In this letter, he related his discouragement over the technical talks with Soviet scientists on the problem of underground test detection. While the Soviets had been cooperative in private discussions, even accepting U.S. claims about decoupling, in public sessions "they denied it." Moreover, Brown argued that in recent weeks U.S. scientists in Geneva had concluded that detection "system capability is considerably less than believed even a few months ago." Not only did successful on-site inspection have a "very small" probability of success, but "large hole decoupling" was "much easier than had been thought." Brown's comments on the possibilities of evasion suggested that the demands on U.S. intelligence capabilities were much greater than Allen Dulles had suggested a few months earlier (see Document 17). Just as McCone had suggested a "threshold" test ban in the meeting with Nixon, Brown was thinking along the same lines, in this instance a ban on atmospheric tests and on "underground for yields higher than about 100 or 150 kilotons." These suggestions presaged future policy developments. Thus, in early February 1960, the U.S. proposed a limited test ban treaty banning atmospheric, underwater, and high altitude tests and underground tests above a 4.75 seismic magnitude reading--the equivalent of 19 or 20 kilotons of explosive yield--the threshold at which underground tests could be adequately monitored. Moreover, the three powers would begin a joint research program on improvements of underground test detection below the threshold. With Eisenhower and Macmillan in agreement on an approach to the Soviets on the test ban, it was necessary to discuss the problems of a joint research program with Moscow on underground tests detection. Kistiakowsky believed that more research might enable the 180 station network to reach the 90 percent level of certainty posited by the Geneva experts, although the problem of "muffled or decoupled shots" would remain. Eisenhower remained unruffled about the low prospects for a 100 percent certainty and Kistiakowsky assured him that with a "reasonable number" of on-site inspections, "any potential violator would face a real risk of getting caught." The participants also discussed the problem of special nuclear weapons tests for research purposes and agreed that it was possible to establish safeguards so that the Soviets would not think that Washington was trying to improve its nuclear stockpile. In what would turn out to be a short-lived proposal, Kistiakowsky suggested declassifying for this purpose a "simple gun-type of nuclear weapon which would be of little value to a potential Nth country" proliferant. Apparently, he assumed that a would-be nuclear power would be interested in acquiring more efficient, advanced-design nuclear weapons. That the problem of nuclear proliferation was assumed to preoccupy the Soviets is also plain from Macmillans' statement that the Soviets wanted a sound agreement because of their concerns about the spread of nuclear weapons. Noting the development of gas centrifuges for producing highly-enriched uranium, McCone implied that the nuclear proliferation problem could become a serious one. By early May, the U-2 crisis was unfolding which doomed the Paris summit. Nevertheless, in the hope that something might turn up, the Principals met to discuss black boxes and seismic research, high altitude tests, and the U.S. position on inspection quotas. Interestingly, the participants had second thoughts about declassifying nuclear weapons designs for special tests; as Herter observed, "black box" seismic stations would "obviate the necessity of declassifying devices which might have served to increase the nuclear capability of other States." Detecting high altitude tests and missile launches had been a continuing concern and the Principals discussed the latest research which would permit ground-based systems to detect the former and Midas satellites that could discern the latter. Doyle Northrup, Technical Director for Air Force Technical Application Center (AFTAC), the organization responsible for detecting nuclear weapons programs abroad, startled the Principals when he stated that a recent cost estimate for establishing 22 control posts in the Soviet Union with 100 seismic arrays at each one was between one and five billion dollars. Northrup promised the budget-conscious Principals more research on costs noting that no one had tried to estimate the expense of establishing "unmanned stations" in the Soviet Union. The number of inspections received inconclusive discussion, although the Principals eventually agreed to a proposal for inspection of 20 percent of unidentified events above the 4.75 threshold, about 20 inspections annually. The group also heard a briefing by Albert Latter on a RAND Corporation study on ways and means to increase the effectiveness of control posts in identifying seismic events. Through redistributing and increasing control posts on Soviet territory, Latter suggested that it would be easier to identify earthquakes and narrow the range of events that required inspection. Herter received the RAND briefing with enthusiasm suggesting that it pointed to "tremendous" possibilities in identifying seismic events. Document 25: Central Intelligence Agency, Office of Current Intelligence, Current Intelligence Weekly Summary, 24 August 1960, excerpt on "The Nuclear Test Ban Talks"
This CIA document provides a useful account of the verification issues that divided the United States and the Soviet Union during first two years of the test ban negotiations. It is particularly useful for summarizing developments after the collapse of the summit. Abandoning their position that the number of inspections could be discussed only at the heads of state level, in July 1960 the Soviets offered three "veto-free" annual inspections inside the Soviet Union of any suspicious events. They rejected the U.S.-British proposal for 20 inspections a year. These positions set the stage for a protracted debate on on-site inspection that would force both sides back to a limited test ban proposal. At a meeting of the National Security Council, Eisenhower's successor, John F. Kennedy, showed his lack of enthusiasm for the early resumption of nuclear testing. Not only would world opinion likely to be "very adverse", other factors had to be considered, one of which--whether the Soviets were covertly cheating--was raised by Kennedy's national security assistant McGeorge Bundy. DCI Allen Dulles could not give any assurances either way; it would be a "matter of luck" whether the intelligence system detected a low-yield Soviet test. Kennedy raised a number of issues that would have to be addressed before he was ready to make any decision, such as whether there was to be any give in the Soviet position, the location of testing, and how long testing would continue. The NSC meeting on 19 May included a briefing by Director of Defense Research and Engineering Harold Brown (formerly, director of Livermore Radiation Laboratory and a member of the U.S. delegation to the Geneva test ban talks); Seaborg did not include any details in his journal, but some of Brown's points may appear in this record of a Committee of Principals meeting from a week later. After the Committee heard negotiator Arthur Dean on the "dim" prospects for an agreement, Secretary of Defense Robert McNamara argued that a new round of tests would reduce the costs and increase the effectiveness of the weapons stockpile. While the intelligence on Soviet intentions was ambiguous but laden with suspicion, the feeling among scientists and defense officials was that the United States "could not afford not to move forward in the nuclear testing field because we don't know what others will do." Some observers found this less than convincing and, like his predecessors, Secretary of State Rusk "pointed out the serious political reaction that we would have to expect were we to resume testing." Rusk left the meeting early and the meeting was inconclusive, but the momentum to end the moratorium would prove irresistible, especially when tensions with Moscow sharpened during the summer of 1961. While pressure for resume testing mounted, the Kennedy administration continued the negotiating track at Geneva. 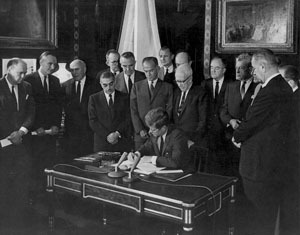 The Japanese government had a special interest in the test ban and the Kennedy administration realized that it was critically important to show Tokyo that it was making a good faith effort on this issue, in order to assure Japan's support for securing a UN General Assembly endorsement of a treaty with "effective controls." With this message to the embassy in Tokyo, the State Department sent briefing material showing its efforts to negotiate a treaty. Included in the briefing paper was a description of the "compromise proposals" that the Americans and the British had tabled in March and May. As before the treaty posited a threshold test ban but the moratorium on underground tests was increased from two to three years, the number of on-site inspections could be as low as 12 (instead of 20), while the number of number of control posts in the Soviet Union would be reduced to 19 (instead of 22). From the State Department standpoint, the Soviets had "made no constructive response" to this proposal. In late August, the negotiating track at Geneva continued, with Ambassador Dean offering a new proposal that involved lowering the threshold as well as clustering monitoring stations in earthquake zones. President Kennedy was worrying about the position of the neutral Third World nations, not least the government of India, which had supported a United Nations resolution in favor of an unlimited moratorium without the controls that Washington found essential. Writing to his close acquaintance, the famous economist and Ambassador to India John Kenneth Galbraith, Kennedy wanted Prime Minister Nehru to understand that despite the U.S.'s efforts, the Soviets had "lost interest in any effective treaty." Kennedy expected that any renewed U.S. initiative at Geneva would be rebuffed and that Washington would have to approach the United Nations for a "good resolution of our own on nuclear testing." While Kennedy hoped that Galbraith's "strong effort" could persuade Nehru to support the U.S. position, a few months later the Indian government would win UN support for a resolution favoring a comprehensive test ban without inspections. Document 31: Draft "JAEIC Statement, 1430 Hours, 1 September 1961"
Khrushchev formally rejected the Kennedy-Macmillan proposal on 9 September, but events a few days earlier convinced Kennedy that the Soviets had already made a decision. On 5 September, during a talk with AEC chairman Seaborg, he discussed plans to resume underground testing later in the month. To avoid "adverse comment" about U.S. military power; he wanted the first test to have a yield that was "larger" than the first Soviet test whose explosive yield was 100 kilotons. Seaborg told him that the AEC could not arrange a large test before 15 September; a larger one involving the Terrier air defense missile would occur later. Kennedy did not make a decision at the meeting, but when he learned that the Soviets had held their third test, he ordered the resumption of underground testing, with the first detonation to occur on 15 September. Kennedy was not sure if it was the "right decision," he later explained to UN Ambassador Stevenson, but "What choice did we have? They had spit in our eye three times. This conversation between Robert Matteson, a Foreign Service Office assigned to the U.S. mission to the United Nations, and one of his Soviet counterparts, Igor Usatchev, highlights the tensions over Berlin and nuclear testing. Soviet threat to sign a treaty with the GDR, which would "do away with the occupation rights in West Berlin," remained a source of great anxiety in the West, even after the East Germans had started to build the wall. Usatchev also shed light on the concerns motivating Moscow's decision to break the moratorium; he saw Soviet military activity as a "reaction" to President Kennedy's military buildup but also to the more advanced U.S. nuclear weapons program. While the U.S. had tested "over a hundred" (actually, closer to 200), the Soviets had conducted 70. The Soviet diplomat may have astonished his interlocutor with his emphasis on Moscow's interest in a 100 megaton weapon, which he saw as advantageous militarily, partly because it would conserve scarce fissile materials. The Soviets did not test a 100 megaton device but some weeks later tested one of half that strength, an event that would shock the world. During one of their regular consultations, State and Pentagon officials considered possible Soviet motivations for resuming nuclear test. Besides Moscow's interest in the development of smaller yield weapons, the Soviets wanted to test anti-ballistic missile weapons as well as a "triggering device for a huge nuclear weapon." "[P]sychological" reasons were briefly mentioned; the participants may well have agreed that Khrushchev was trying to overawe the West during the Berlin crisis. This did not perturb the Joint Staff representatives who believed that the Khrushchev "must know that we have enough power now to knock Russia `off the map'." The Joint Staff agreed with an assessment signed by Ambassador Lwelleyn Thompson, the State Department's astute Khrushchev watcher. Noting Moscow's "defensive" posture and the possibility that the Soviets "consider their position relative to our as worsened", Thompson nevertheless cited Khrushchev's private statements that "we are substantially equal in our ability to damage each other." Like other observers, Thompson saw the Soviet test series as an effort to "obtain more sophisticated warheads which would require less material for the same effect." While the U.S. was conducting its underground test series, the directors of the AEC nuclear weapons labs reinforced earlier pressure to resume atmospheric nuclear testing, to test large yield weapons but also a variety of tactical nuclear weapons. Testing would occur in the Pacific, although some at the Nevada test site, with total fission yield limited to reduce fallout. Despite the interest in atmospheric testing, costlier underground testing would continue "to improve our techniques" in the event an atmospheric test ban came to pass. Seaborg suggested that President Kennedy approve atmospheric tests while the Soviets were holding their own series because the "reaction and pressure against it might be much more severe" if Washington held such tests later. Kennedy had authorized preparations for them, although he would not make a final decision for several months. General Curtis LeMay, the Air Force Chief of Staff, the founding father of the Strategic Air Command, and a fervent proponent of nuclear testing, sought scientific support for testing of Air Force weapons. His advisers turned to the Air Force's official scientific advisers but also to Edward Teller, then serving as Professor at Large in the University of California system. Indeed, Teller and the Air Force Scientific Advisory Board "strongly" supported atmospheric testing in order to provide scope for a variety of tests. Among those experimental items (X) on the wish list were the XW-50 (deployed on the Pershing I missile in 1963), XW-56 and 59 (later deployed on Minuteman), and the TX-43 bomb (later deployed on a number of aircraft). (Note 49) When commenting on the Soviet 50 megaton test, Teller and his associates observed that that event had "reawakened interest in high-yield testing by the United States." Astonishingly, they suggested consideration of weapons with yields up to 1000 megatons (!) "for their possible military use." The subject of high yield weapons would generate much thinking and planning in the following years, but the fantastic notion of 1,000 megaton weapons appears to have dropped by the wayside. While the Geneva talks had folded, a new forum for the negotiations, the Eighteen-Nation Disarmament Committee (ENDC), emerged in March 1962 although talks held there failed to break the impasse. With diplomacy failing, a reluctant Kennedy headed toward final decisions on atmospheric tests. Even after 2 March, when he gave a speech announcing the government's plans to begin a new test series, he collaborated with Macmillan in an early April, last ditch effort, to win Soviet acceptance of the principle of international verification. Otherwise, testing would resume at the end of April. On 18 April, he privately met with McNamara and authorized an atmospheric test series, beginning 25 April. He then met with the NSC to review the test program, with most of the participants unaware of Kennedy's decision (and some, such as UN Ambassador Stevenson, vainly hoping they could head it off). (Note 51) Having given the go-ahead, Kennedy was concerned about the public relations implications of atmospheric testing; he was plainly concerned that a test scheduled for the Nevada Test Site would produce a mushroom cloud that could be photographed. While Seaborg suggested that the explosion might not produce such a cloud, Kennedy wanted the test to be placed at the end of the series, perhaps hoping that it then would attract less attention. An inconclusive discussion of the timing of an announcement followed, with Kennedy assuring the Council that the AEC would get at least five days of "lead time" making it possible to announce the tests just as they were beginning. What the Kennedy administration saw as an obdurate Soviet position on inspections led to suspicions in Washington that the Soviets were "marking time" as if "waiting for something to happen." Khrushchev, who was readying his decision to deploy nuclear missiles to Cuba, was aware that something would "happen" but Washington officials wondered if the Soviets might make a technical "breakthrough" from nuclear testing that could significantly increase their global influence. A group of intelligence and politico-military analysts examined that proposition and concluded that such a technical breakthrough was unlikely. For example, Moscow could make "solid progress" in developing an AICBM, but it would lack the resources needed for developing a weapons system that could do more than defend such "key centers" as Moscow. In any event, the United States would find it "technically manageable" to counter an AICBM with decoys (a point still made by critics of National Missile Defense). The "advantage in missilery is still with the offense." In light of the "political and psychological advantages" that the Soviets had gained from their nuclear tests, the analysts believed that Washington needed to develop a political strategy in response to the Soviet test series. Secretary of Defense Robert McNamara shared the relative optimism of the intelligence analysts (and PSAC in 1958) that the United States was holding its technical advantage over the Soviets in the nuclear weapons realm. After reviewing the status of U.S. strategic and tactical nuclear weapons programs, McNamara advised the president that a comprehensive test ban "is likely to be to the advantage of the United States" because it was already ahead of the Soviets in developing smaller, high-yield nuclear weapons. Under a comprehensive test ban, the rate of increase of yield-to-weight ratios would slow and the United States would be unable to continue investigations into nuclear weapons but the Soviets would have the same disadvantage. A test ban limited to the atmosphere would allow the United States to continue underground tests without having to worry about Soviet cheating. The unfolding of the Cuban crisis prevented new initiatives but post-crisis talks with Soviet Deputy Premier Anastas Mikoyan showed the gap between the two sides. Mikoyan brought up an interesting issue, the possible use of "sealed" or "black box" automatic seismological stations for detecting underground tests as a substitute for "manned stations" which the Soviets assumed would be used for espionage. Rusk refused to put major reliance on black boxes because he did not believe that the technology could, by itself, differentiate nuclear tests from earthquakes. Nevertheless, he welcomed evidence from the Soviets about the capabilities of "unmanned boxes." Rusk and Mikoyan had mutual concerns about nuclear proliferation but the former was reluctant to concede to anything that would undercut nuclear sharing arrangements with NATO. Nevertheless, because Kennedy's nuclear sharing policy opposed physical transfer of the weapons to allies in peacetime, Rusk undoubtedly saw common ground in the proposition that the United States "is not interested in increasing the number of governments who have nuclear weapons." No doubt Rusk also believed that Mikoyan would endorse the proposition that the United States did not "want other governments to be in a position to use nuclear weapons by their own decisions." which we no longer wanted because the Chinese Communists were conducting an extensive test program. One possibility was exploring with the Soviets a withdrawal clause that would "become operative [after] only a given period of time", such as two or three years. This would give the French time to "finish testing before the Chinese really got started." McNamara provided Kennedy with an estimate of the number of countries that had the capability to develop nuclear weapons in the coming years and the general motives for countries to or not to do so. Owing to the heavy costs of nuclear programs and the likelihood of international pressure, he believed that it was unlikely that all countries able to produce nuclear weapons would do so during the next decade. Like the ACDA analysts, McNamara believed that a comprehensive test ban was necessary but not sufficient to deter countries from developing atomic weapons. He also discussed the problem of the Chinese nuclear program. China, of course, was unlikely to sign a test ban agreement, but the possibility of Moscow putting pressure on Beijing to sign was no more likely than Washington joining with Moscow to place pressure on France to halt its nuclear program. A talk between Khrushchev and British Ambassador Sir Humphrey Trevelyan illustrated the conflicted nature of the test ban dialogue. Still interested in relying on "black boxes," Khrushchev would make no further concessions on inspections; he "would add not a single one." To the British argument that scientists saw inspections as crucial, Khrushchev responded with the familiar argument that U.S. and British scientists were part of a plan to "introduce spies into the USSR." Khrushchev may have been especially fixated with espionage because only a few months earlier, the KGB had caught Oleg Penkovsky, a military intelligence officer who had provided American and British intelligence with highly significant information on the Soviet strategic position. Moreover, given the top-level U.S. statements about the intelligence benefits of inspection, Khrushchev's suspicions were not completely off the mark. It would be years before senior Soviet officials would countenance the degree of domestic openness that was compatible with the acceptance of on-site inspection. This Committee of Principals discussion suggests the bleak political climate for the test ban negotiations during the spring of 1963. The U.S. negotiating position was under attack from Republican and Democratic conservatives who argued that its verification procedures were insufficiently tough. While Kennedy, Macmillan, and Khrushchev had secret exchanges of correspondence on the possibilities of further negotiations, top policymakers continued to treat the CTBT as a legitimate goal because they saw nowhere else to turn. (Note 58) For Rusk and McNamara a CTBT, even without ironclad verification provisions, was better than any alternative: as McNamara put it, "the risk to the United States without a test ban treaty was greater than with a test ban treaty." As bad as the problems with Congress was the opposition by the Joint Chiefs, who saw a treaty without a threshold as an invitation to cheating. While declassifying information on the relative U.S.-Soviet nuclear weapons position would show the U.S. lead, the Principals were not willing to take that step (which, in any event, could have complicated the Soviet position in the negotiations). Whether a treaty would include provisions for peaceful nuclear explosions (PNEs) was one of the most contentious issues during this discussion. The Atomic Energy Commission anticipated using "clean" nuclear devices for a variety of public works project, but critics among the Principals thought that a PNE development program raised too many problems, such as the possibility of disguising weapons tests. In this famous speech, Kennedy broke the ice with Khrushchev by making a public declaration in favor of peace and arms control. An important influence was the writer and editor Norman Cousins who had met secretly with Khrushchev several times since 1962 in an attempt to get the two powers beyond the dispute over the number of inspections. Even some of Cousin's own language, such as "making the world safe for diversity" found its way into the text. (Note 59) Toward the end of the speech, after Kennedy discussed the test ban negotiations and the problem of nuclear proliferation, he announced that the United States would not conduct any more atmospheric tests as long as other nations refrained from doing so. Drawing upon the understanding that he, Macmillan, and Khrushchev had already reached about high-level talks, Kennedy also declared that Washington, London, and Moscow would soon resume negotiations on a test ban treaty and that United Kingdom and the United States would send a senior delegation to Moscow for the discussions. While Kennedy did not name any names, he quickly settled on Ambassador-at-Large W. Averell Harriman, who had met with Khrushchev before and had the stature needed for a mission of this sort. A few days after the President's speech, Kennedy's advisers discussed the significance of the Harriman mission to Moscow and the prospects for a comprehensive agreement. While Rusk had "no illusions" about the prospects, he cited Kennedy's thinking that the Harriman trip was a "last chance" for an understanding with the Soviets; Rusk also believed that the Soviet concern about "bloc problems"--which ranged from Sino-Soviet tensions to growing divergences between Eastern Europe and Moscow-- might produce some flexibility. The administration had tabled various CTBT drafts since 1961, but the Principals were now reluctant to publish the latest draft for fear that it invite controversy--a "head-on collision"--especially if the Joint Chiefs of Staff criticized the draft when testifying before Congress. That the Joint Chiefs, according to Chairman Maxwell Taylor, were possibly more amenable to an atmospheric test ban offered some hope, but only if the Soviets switched gears. Plainly Rusk was unhappy about some of the critics such as Edward Teller, whom he thought was not "talking as a technical man when he talked about the test ban." A continuing element of controversy was whether a treaty would authorize PNEs, which the AEC continued to support. When Seaborg mentioned a program to build a new Panama Canal with nuclear explosive, a skeptical White House staffer Spurgeon Keeny observed that building a canal "would require dozens or hundreds of shots, which would be wholly inconsistent with a test ban treaty." Seaborg, however, hoped that such a provision would interest Moscow. Kennedy's and Macmillan's correspondence with Khrushchev in the spring of 1963 led to a mutual decision to hold high level talks in Moscow on the test ban problem, with Harriman representing the U.S. and Lord Hailsham the U.K. (Note 61) This meeting, between Harriman, Foster, and the president's longtime friend, British Ambassador Ormsby-Gore, showed the latter trying to find a basis for an agreement on inspections. While Foster raised the possibility of a limited agreement with a numerical quota of underground test, Ormsby-Gore questioned whether the Soviets would climb down from their comprehensive agreement or nothing position. The discussion of agreements on side issues---U.S. proposals on non-proliferation and Soviet proposals for a NATO-Warsaw Pact non-aggression pact (NAP)--suggested that significant problems, such as the U.S. multilateral force (MLF) proposal and Western European concerns about a NAP, were likely barriers to any agreements on those proposals. In any event, as Ormsby-Gore suggested, the possibility of a test ban agreement depended on the outcome of high-level Sino-Soviet discussions. At the end of June, as President Kennedy's visit to Western Europe, including West Berlin unfolded his party had substantive discussions with the British which produced an agreed U.S.-UK position for the Harriman-Hailsham trip to Moscow. As before, the two sides would try to reach a settlement on a comprehensive agreement; to minimize disagreements with Khrushchev, they would initially avoid discussing numbers of inspections, but emphasize the principle of inspections and offer safeguards against espionage. If a comprehensive agreement could not be negotiated, then the "next object" should be a limited, three environments agreement, with no restrictions on underground tests. If the Soviets also rejected that, other fallback positions were possible. If the Soviets brought up proposals for a non-aggression pact, Harriman and Hailsham would emphasize the importance of prior agreement on test ban and non-proliferation treaties. On 2 July, Nikita Khrushchev refocused the test ban debate when he gave a speech in East Berlin. Accusing the West of using the inspection issue as a cover for "intelligence purposes", he called for a three environments test ban that made the inspection issue irrelevant. Arguing that a test ban was not enough to ease Cold War tensions, Khrushchev also called for a "nonaggression pact between the two main military blocs -- the NATO countries and the Warsaw Pact States." 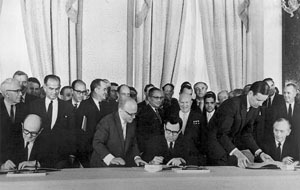 The signing of two agreements, Khrushchev argued, would "create a new international atmosphere, more favorable for settling the outstanding issues of our time." Although State Department analyst wondered whether Khrushchev would insist on simultaneous agreement on a limited test ban and a non-aggression pact (NAP), they believed that the language was ambiguous enough to "permit Khrushchev freedom of maneuver." For the State Department, an NAP was something to avoid because it raised "issues very divisive in the Alliance", such as the prospect of the "acceptance and stabilization of an unsatisfactory status quo, including the division of Germany." Early in the evening of 9 July, Kennedy met with the NSC to discuss the Harriman mission. Still unsure whether a limited three environments test ban treaty was negotiable, the participants briefly discussed an agreement that permitted a quota of underground tests. Nevertheless, if an atmospheric test ban was feasible, Rusk wanted Harriman to be able to conclude an agreement "on the spot." Bundy wondered whether the French should be consulted, which raised the question of whether it would be possible to induce Paris to sign a limited test ban treaty. Maxwell Taylor's comments questioning the advantages of an atmospheric test ban raised the continuing problem with the Chiefs, but Kennedy declared that the issue was settled: "such a ban is to the advantage of the U.S." Nevertheless, Taylor vainly pushed away on the issue. Not long after Harriman and Hailsham had arrived in Moscow, a long meeting with Khrushchev settled the test ban problem, if not all the details. This was Khrushchev's day and he talked and talked about the Soviet Union's economic progress and his diplomatic agenda: a test ban, a NATO-Warsaw Pact nonaggression pact (NAP), a freeze in military spending, and a peace treaty between the two Germanies. Hailsham and Harriman were mainly interested in the test ban and nuclear proliferation but they politely heard Khrushchev out, making only a few interjections, with Harriman showing strong interest in determining Khrushchev's thinking about the Chinese nuclear program. Khrushchev would only accept a three environments test ban, which he believed met the demands of world opinion. The question of an atmospheric test ban was settled and Harriman, Hailsham, and Russian Foreign Minister Gromyko negotiated a treaty "on the spot" within a matter of days. While Harriman was in Moscow, the CIA sent him (and Ambassador Kohler) "eyes only" daily reports, which included digests of the Chinese and Soviet press and related intelligence information. In this report, Chinese opposition to the test ban and the deleterious impact of the test ban negotiations on Sino-Soviet relations is evident. In an "eyes only" report to the State Department, Ambassador Kohler reported on a brief exchange with the "outspoken" Mrs. Gromyko during a Polish embassy reception. The foreign minister's spouse elucidated the anti-Chinese aspect of Moscow's interest in the test ban, as a way to "call [Beijing] to account" when it had its first nuclear test. Document 62: "CIA Presentation to the Joint Chiefs of Staff, 30 July 1963"
As the ink on the treaty was drying, senior officials considered ways and means to expand and improve the U.S. Atomic Energy Detection System. Adrian Fisher commented on AFTAC plans to expand the AEDS by establishing monitoring stations in Scandinavia, East Asia, and the Southern Hemisphere, so as to permit world-wide coverage. 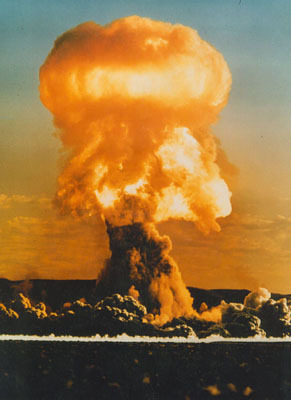 Fisher cataloged the major AEDS techniques for detecting underwater, atmospheric, and space nuclear tests and described plans to expanding and improve those capabilities. In particular, he was interested in plans to deploy satellites, in part because the "mere existence of surveillance satellites in orbit provides evidence of our determination to police all environments." In addition, Fisher strongly supported ARPA-VELA's ongoing research and development activities on verification technologies, but requested major emphasis on remote seismic detection as well as the detection of underwater and atmospheric events. During the years that followed, AFTAC was significantly beefed up so that its monitoring apparatus could detect nuclear activities in China, the Soviet Union, and elsewhere. 1. Tom Squitieri, "Bush Pushes for New Nukes, USA Today, 7 July 2003; Editorial, "Nuclear Doubts in the House," New York Times, 16 July 2003; Jake Thompson, "Big Guns Will Discus Nuke Policy," Omaha World-Herald, 31 July 2003; William J. Broad, "Facing a Second Nuclear Age, New York Times, 3 August 2003. 2. For the text of the treaty, see <http://www.ourdocuments.gov/content.php?page=transcript&doc=95>. 3. The State Department's historical document series, Foreign Relations of the United States, provides critically important starting points for research on the subject. See U.S. State Department, Foreign Relations of the United States 1958-1960, Vol. III (Washington, D.C.: Government Printing Office, 1996), and U.S. Department of State, Foreign Relations of the United States, 1961-1963, Volume VII, Arms Control and Disarmament (Washington, D.C.: Government Printing Office, 1995) (herein cited as FRUS 61-63, VII). 4. Natural Resources Defense Council, Archive of Nuclear Data, at <http://www.nrdc.org/nuclear/nudb/datab15.asp>. For more details on U.S. nuclear tests, see U.S. Department of Energy, United States Nuclear Tests July 1945-September 1992 at <http://www.nv.doe.gov/news&pubs/publications/historyreports/pdfs/DOENV209_REV15.pdf>. 5. McGeorge Bundy, Danger and Survival: Choices About the Bomb in the First Fifty Years. (New York: Random House, 1988), p. 329; Barton C. Hacker, Elements of Controversy: The Atomic Energy Commission and Radiation Safety in Nuclear Weapons Testing, 1947-1974. (Berkeley, CA: University of California Press, 1994), pp. 148-152, 157-158; Lawrence Wittner, The Struggle Against the Bomb, Vol. 2: Resisting the Bomb: A History of the World Nuclear Disarmament Movement, 1954-1970 (Stanford: Stanford University Press, 1997), pp. 146-148, 153-154, 157-159. See also Richard G. Hewlett and Jack M. Holl, Atoms for Peace and War: 1953-1961: Eisenhower and the Atomic Energy Commission. (Berkeley, CA: University of California Press, 1989), pp. 271-295. <http://rex.nci.nih.gov/INTRFCE_GIFS/WHTNEW_INTR_97.htm>. For the executive summary of the NCI-CDC study that suggested 11,000 extra deaths, see <http://www.cdc.gov/nceh/radiation/fallout/report.pdf>. For the National Research Council's assessment of that study, see "Cancer Risk Study was Competently Performed," Nuclear News, April 2003. 7. Wittner, The Struggle Against the Bomb. For an early major study, see Robert A. Divine, Blowing on the Wind: The Nuclear Test Ban Debate 1954-1960 (New York: Oxford University Press, 1978). 8. Gregg Herken, Cardinal Choices: Presidential Science Advising from the Atomic Bomb to SDI. (New York: Oxford University Press, 1992), p.82. 9. Herken, Cardinal Choices, p. 84. 10. For useful background on these developments, see Divine, Blowing on the Wind, pp. 174-212. 11. Ibid. pp. 225-227; Greg Herken, Brotherhood of the Bomb (New York: Henry Holt, 2002), pp. 325-327. 12. Robert J. Watson, History of the Office of the Secretary of Defense. Volume IV. Into the Missile Age, 1956-1960. (Washington, D.C.: Historical Office, Office of the Secretary of Defense, 1997), pp. 699-700. 13. Ibid., pp. 702-704; Divine, Blowing on the Wind, pp. 243-244. 14. Ibid., p. 303; McGeorge Bundy, Danger and Survival, pp. 332-333. 15. For useful sources on the Kennedy administration and the test ban, see Glenn T. Seaborg, Kennedy, Khrushchev, and the Test Ban (Berkeley, CA: University of California Press, 1981), and Kendrick Oliver, Kennedy, Macmillan, and the Nuclear Test Ban Debate, 1961-63 (New York: Macmillan Press, 1998). See also Carl Kaysen, "The Limited Test Ban Treaty of 1963," and Bernard J. Firestone, "Kennedy and the Test Ban: Presidential Leadership and Arms Control," in Douglas Brinkley and Richard T. Griffiths, eds., John F. Kennedy and Europe (Baton Rouge: Louisiana State University Press, 1999). For tests during 1961 and 1962, see Natural Resources Defense Council, Archive of Nuclear Data. Nuclear Weapons & Waste: In Depth: Index, at <http://www.nrdc.org/nuclear/nudb/datab15.asp>. 16. Public Papers of the Presidents of the United States: John F. Kennedy Containing the Public Messages, Speeches, and Statements of the President. January 1 to November 22, 1963. (United States Government Printing Office: Washington, DC. 1964), p. 107. 18. Gordon Chang, Friends and Enemies: The United States, China, and the Soviet Union, 1948-1972. (Stanford, CA: Stanford University Press, 1990), pp. 245-246. 19. Memorandum from the Assistant Director of Central Intelligence for National Estimates to the Under Secretary of State for Political Affairs, 8 July 1963, FRUS 61-63, VII, p.771. 20. Memorandum of Conversation, 8 August 1962, FRUS 61-63 VII, p.541. For the impact of the West German nuclear question on U.S. and Soviet policy, see Marc Trachtenberg, A Constructed Peace: The Making of the European Settlement, 1945-1963 (Princeton: Princeton University Press, 1999), Part III, passim. 21. Deputy Director for Intelligence, CIA, to Director of the Arms Control and Disarmament Agency, 1 October 1962, FRUS 61-63, VII, p. 582. 22. Seaborg, Kennedy, Khrushchev, and the Bomb, pp. 40-41, 180-181; Kaysen, "The Limited Test Ban Treaty of 1963," p. 108; Oliver, Kennedy, Macmillan and the Nuclear Test Ban Debate, pp. 154-155; Wittner, Resisting the Bomb, p. 400..
23. See document 49 below. 24. Memorandum from the Joint Chiefs of Staff to Secretary of Defense McNamara, 20 April 1963, FRUS 61-63, VII, p. 684; Edward Teller, The Legacy of Hiroshima, pp. 200-201. 25. See document 48 below. 28. Burr and Richelson, p. 75. During an October 10 meeting with President Kennedy, Soviet Foreign Minister Andrei Gromyko agreed that the treaty would, "make China's political situation more difficult and delicate, presumably by increasing the PRC's isolation and raising pressures on it to follow nonproliferation standards." Ibid. 29. Vladislav Zubok, "Look What Chaos in the Beautiful Socialist Camp: Deng Xiaoping and the Sino-Soviet Split, 1956-1963," Bulletin of the Cold War International History Project 10 (March 1998): 153-162, <http://wwics.si.edu/topics/pubs/ACF185.pdf>; State Department telegram to Embassy in Soviet Union, 15 July 1963 and Embassy Telegrams to State Department, 18 and 27 July1963, FRUS 61-63, VII, pp. 801, 808, and 858-860. 31. Firestone, "Kennedy and the Test Ban: Presidential Leadership and Arms Control," pp. 91-93; Wittner, Resisting the Bomb, pp. 424-432; William J. Broad, Teller's War: The Top Secret Story Behind the Star Wars Deception (New York: Simon & Shuster, 1992), p. 51. See document 64 for details of the JCS position. 32. Wittner, Resisting the Bomb, p. 430. 33. For the text of the CTBT, see <http://www.state.gov/www/global/arms/treaties/ctb.html>. For a 2002 report by the National Academy of Sciences on the "good" verification capabilities of the CTBT system, see <http://www4.nas.edu/news.nsf/isbn/0309085063?OpenDocument>. For candidate Bush's opposition, see Dan Balz, "Bush Favors Internationalism; Candidate Calls China a 'Competitor,' Opposes Test Ban Treaty." Washington Post, 20 November 1999. 34. For details on the Bravo Castle test, see <http://nuketesting.enviroweb.org/hew/Usa/Tests/Castle.html>. 35. For background on the creation of PSAC and the Bethe report, see Herken, Cardinal Choices, pp. 101-109. The idea of "clean" thermonuclear weapons that would produce little or no fallout and could be used for major construction projects was a pressure point against a test ban but led to no significant results. Early tests of "clean" bombs produced much more fallout than the weapon dropped on Hiroshima. See Broad, Teller's War, pp. 45-49, and Herken, Brotherhood of the Bomb, pp. 324-325. 37. Memo from Carl Kaysen to President Kennedy, "New Data on Detecting Underground Nuclear Explosions," 20 July 1962, FRUS 61-63, VII, pp. 489-491. 38. Editorial note, U.S. State Department, Foreign Relations of the United States 1958-1960, Vol. III (Washington, D.C.: Government Printing Office, 1996), p. 730. 39. Tukey, the famous inventor of the "bit" concept, would play a key role in developing methodology for distinguishing nuclear tests from earthquakes. See obituary in Physics Today at <http://www.physicstoday.org/pt/vol-54/iss-7/p80.html>. 40. Even Hans Bethe "confirmed Latter's decoupling theory, admitting that he had erred in his own earlier assumptions that it made no difference how an underground test was detonated." Divine, Blowing on the Wind, p. 254. 41. Memorandum of conference with the President, 23 July 1959, Foreign Relations of the United States, 1958-1960, III, National Security; Arms Control and Disarmament (Washington, D.C.: Government Printing Office, 1996) (hereinfafter cited as FRUS 1958-60, III) pp. 759-762. 42. State Department memcon, 6 October 1959, FRUS 1958-60, III, pp. 777-789. 43. Public Papers of the Presidents of the United States: Dwight D. Eisenhower Containing the Public Messages, Speeches, and Statements of the President. January 1 to December 31, 1959. (United States Government Printing Office: Washington, DC. 1960), p. 883; Wittner, Resisting the Bomb, p. 408. 44. Memorandum of conference with President Eisenhower, 24 March 1960, Ibid, pp. 861-863. 45. FRUS 1961-63, VII, pp. 106-109, 124-127, 131-132, and 137. 46. Ibid., pp. 149, 160. 47. Ibid. p.162; Kennedy quoted in Carl Kaysen, "The Limited Test Ban Treaty of 1963," p. 103. 48. Wittner, Resisting the Bomb, p. 412; quotation from Victor Adamsky and Yuri Smirnov, "Moscow's Biggest Bomb: The 50-Megaton Test of October 1961," at <https://nsarchive.gwu.edu/CWIHP/BULLETINS/b4a13.htm>. 49. For a list of nuclear warheads, deployed or otherwise, see Stephen I. Schwartz et al., Atomic Audit: The Costs and Consequences of U.S. Nuclear Weapons Since 1940 (Washington, D.C.: Brookings Institution, 1998), pp. 86-92. 50. Oliver, Kennedy, Macmillan, and the Nuclear Test Ban Debate, pp. 58-61. 51. FRUS 1961-1963, VII, p. 441; Kaysen, "The Limited Test Ban Treaty of 1963," pp. 104-105. For statistical data on U.S. (as well as Soviet) atmospheric tests during 1962 and 1963, see the compilation by the Natural Resources Defense Council at <http://www.nrdc.org/nuclear/nudb/datab15.asp>. 52. President Kennedy taped White House discussions of the test ban during the summer of 1962 and printed renditions of the recordings are available in Timothy Naftali, ed., The Presidential Recordings John F. Kennedy The Great Crises, Volume One (New York, W.W. Norton, 2001), pp. 80-185. 53. Seaborg, Kennedy, Khrushchev, and the Test Ban, pp. 161-163. 54. Ibid., pp. 168-171; FRUS 1961-1963, VII, pp. 559-561 and 566-568. 55. Editorial note, ibid., pp. 622-624; Oliver, Kennedy, Macmillan, and the Nuclear Test Ban Debate, pp. 146-147. 56. "Second Oral History Interview with Carl Kaysen," July 1966, by Joseph E. O'Connor, John F. Kennedy Library, p. 123; Kaysen, "The Limited Test Ban Treaty," p. 112. 57. Schwartz, Atomic Audit, p. 83. 58. Oliver, Kennedy, Macmillan, and the Nuclear Test Ban Debate, pp. 169-174. 59. Wittner, Resisting the Bomb, pp. 416-419. 61. For Macmillan's choice of Hailsham, whose performance during the Moscow talks had mixed reviews, see Oliver, Kennedy, Macmillan, and the Nuclear Test Ban Debate, p. 189. 62. Trachtenberg, A Constructed Peace, pp. 388-389. 63. In April 1964, the U.S. Embassy in Moscow discovered a number of listening devices that the Soviets had installed some years before. See "Estimate of Damage to U.S. Foreign Policy Interests (From "Net of Listening Devices in U.S. Embassy Moscow," 2 October 1964, U.S. Department of State, Foreign Relations of the United States, 1964-1968, Vol. XIV, The Soviet Union (Washington, D.C, , Government Printing Office, 2001), pp. 111-114. 64. For Hailsham's role during the talks, see Oliver, Kennedy, Macmillan, and the Nuclear Test Ban Debate, pp.197-198. 65. FRUS 1961-1963, VII, pp. 813-814, 816-817, and 823-824. 66. Ibid., pp. 851-853, 866-868. 67. Trachtenberg, A Constructed Peace, pp. 394-395. 68. Kaysen, "The Limited Test Ban Treaty of 1963," p. 111.